We are a group of radio control enthusiasts who love to build and fly radio controlled model aircraft. Our models are many and varied, from small park flyers to big large Imac and 3D planes with wingspans of up to 3 meters. We fly at the Mt Cottrell Recreation Reserve and welcome visitors. Interested in learning to fly radio control aircraft? We have qualified instructors in the club that donate their time to teach anyone and everyone that wants to lean to fly. For a free flying lesson, contact David on 0409 942 113. 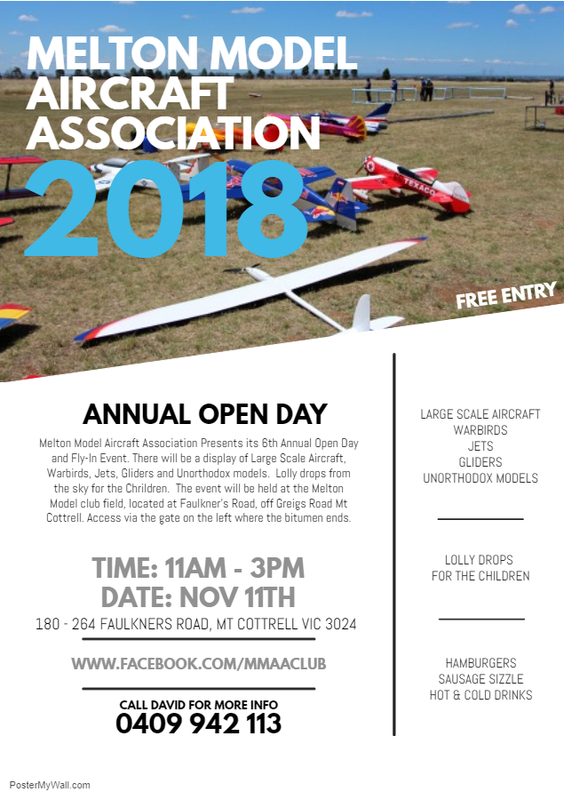 Melton Model Aircraft Assoication Presents its 6th Annual Open Day and Fun Fly Event. Hosting a display of Large Scale Aircraft, Warbirds, Jets, Gliders & Unorthordox Models. There will be Lolly Drops from the Sky for the Children.